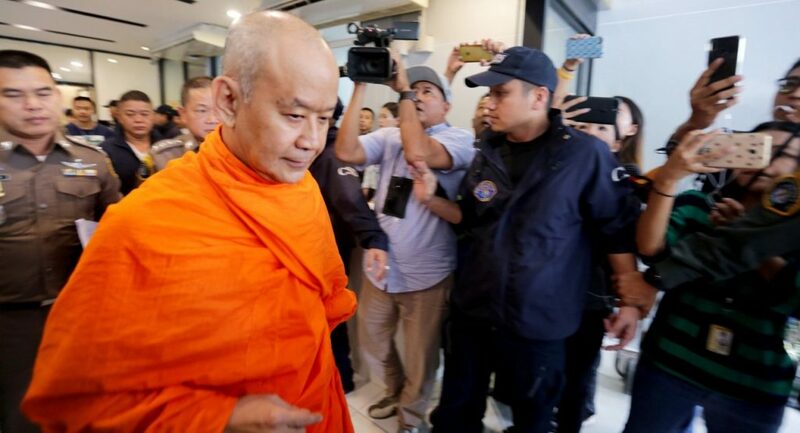 The former abbot of Wat Sa Ket has become the latest senior monk to become a guest of the Bangkok Remand Prison after surrendering to police yesterday. Previously known as Phra Phromsitti (Thongchai Sukhayano), the former abbot had absconded for nearly one week before he contacted police. “He claims he did not report himself to police earlier because he wanted to mark the Visakha Bucha Day,” an informed source said yesterday. Visakha Bucha Day was on Tuesday. 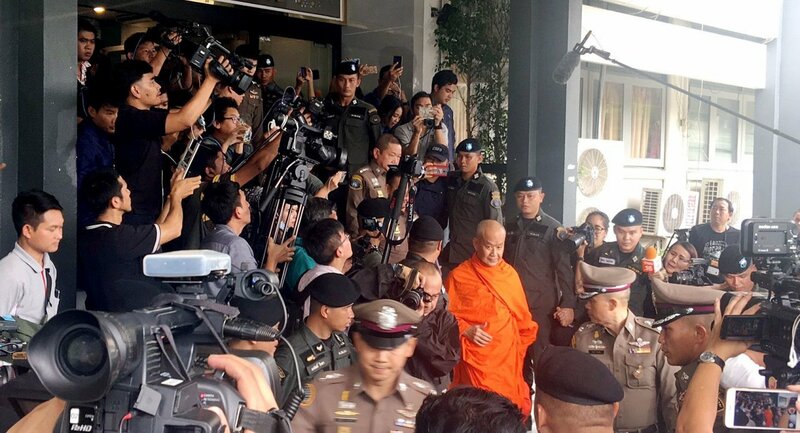 A police source revealed that the monk’s surrender took place after the Crimes Suppression Division (CSD) circulated a letter instructing immigration officials to detain three people close to the former abbot on sight. According to the source, the CSD believes the trio – which includes a Laotian – might have helped the former abbot elude police last week. On May 24, Phra Phromsitti was the only monk from Sa Ket Temple to elude capture during the police raid. The other monk on the run, Phra Phrommedhi (Chamnong Dhammajari), is the abbot of Samphanthawongsaram Temple. As of press time, the whereabouts of Phra Phrommedhi is still unknown. Five other monks implicated in the same scandal were arrested, denied bail and defrocked that day. The National Buddhism Office has accused several senior monks of embezzling state funds for temples. The Sangha Supreme Council (SSC) – the country’s highest body for monastic affairs – dismissed Phra Phromsitti, Phra Phrommedhi and Sam Phraya Temple abbot Phra Phromdilok (Euan Hasadhammo) as its members last week. Yesterday, the Royal Gazette promulgated the King’s royal command to strip the monks of their monastic ranks. Under this royal command, the four other implicated monks also lost their monastic titles. Even though the former abbot of Sa Ket Temple has already lost his monastic rank and left monkhood, he is still revered by many people. A number of his followers gathered at the CSD yesterday to support him. The former Phra Phromsitti surrendered at Sa Ket Temple. The monk was brought to the CSD where he was interrogated for three hours. He was expressionless as he left the CSD. Police asked for permission from the Central Criminal Court for Corruption and Misconduct Cases to detain him at a prison. The court granted the permission and decided to not grant bail to Phra Phromsitti. His lawyer had brought 1 million baht in cash for his bail plea. 62 year old Phra Phromsitti was ordained in 1976 and had been in monkhood until being defrockment yesterday. At the height of his monastic days, he was not just the abbot of Sa Ket Temple but also held several other important monastic positions. A source said Thongchai plans to hold a press conference on the allegations against him in the near future. The ongoing police investigation suggested that Thongchai must have played a role in illegitimately funnelling more than 79 million baht from the Sa Ket Temple in recent years. Some of the money reportedly went to a company that existed only on paper and was controlled by a woman who was close to a senior monk at the Sa Ket Temple.